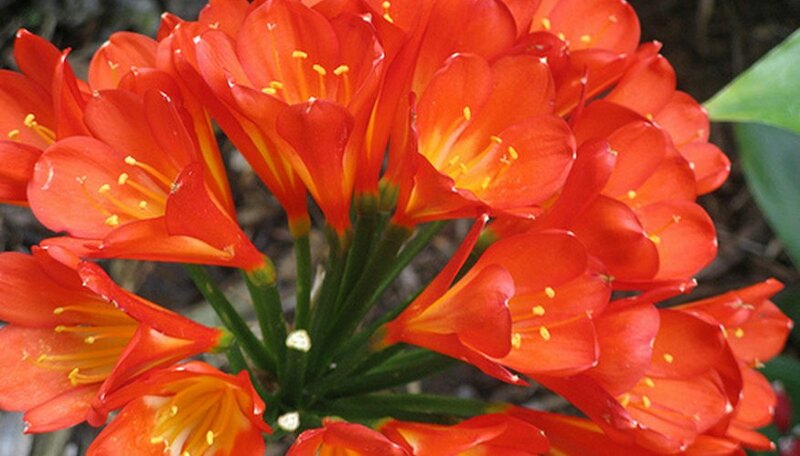 Clivia, also known as kaffir lily, is a genus of flowering plants native to Africa. They are evergreen and form long, thin leaves. Clivia flowers resemble bells in shape, and sit on top of a flower stalk. They range in color from deep orange to pale yellow, and bloom during late winter and early spring. Clivia is a long-lived plant that will continue to flower for many years if properly maintained. Keep clivia in a location that receives bright light all day, but not direct sunlight. Plant in a high drainage soil made up of one part organic compost and two parts potting soil. Keep clivia indoors year round, as leaf burn can occur from exposure to direct sunlight and the plant is unable to survive during winter weather. Water clivia once the soil has dried to a depth of one inch. Apply enough water to thoroughly soak the soil but not enough to make it soggy. Only water once the soil is dry to a depth of two inches during the months of October, November and December. Feed clivia plants every other week using a balanced 20-20-20 NPK fertilizer, beginning in early May. Continue until the final week of August, and then cease fertilizing until after flowering ends in late spring. Refer to the manufacturer's instructions for proper dosage and application of the fertilizer. Remove clivia flower stalks at their base after the color on the blossoms fades. This will prevent extra nutrients from being used to create seeds, which take nearly a year to ripen. Pinch off spent stalks as close to the main stem as possible using your fingers or pruning shears. Clivia contains small amounts of lycorine, and is mildly toxic if ingested in large quantities. Keep the plant away from pets and children, and wash your hands thoroughly after handling.